One country: Pakistan. Two children: Iqbal Masih and Malala Yousafzai. Each was unafraid to speak out. He, against inhumane child slavery in the carpet trade. She, for the right of girls to attend school. Both were shot by those who disagreed with them -he in 1995, she in 2012. Iqbal was killed instantly; Malala miraculously survived and continues to speak out around the world. The stories of these two courageous children whose bravery transcended their youth are an inspiration to all. 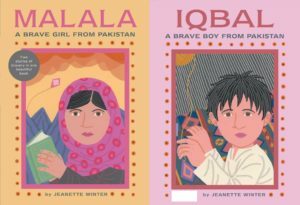 In this picture book Iqbal Masih and Malala Yousafzai are shown as models for our children due to their exceptional courage. They stood for rights and freedom in Pakistan in a society controlled by the Taliban as these non-fiction tales describe. Iqbal was executed for speaking out about child slavery, whereas Malala was shot for defending the right of girls to go to school. Jeanette Winter is an acclaimed author-illustrator that begins each story with an excellent introductory note. This volume is an inspiration to be brave for young kids.